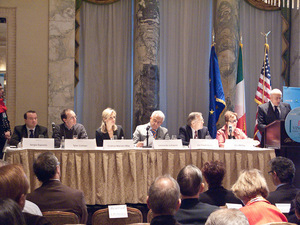 Vinography.com covered the The Future of Italian Wine press conference I moderated at Vino 2011 in New York in late January. The panelists included Jon A. Fredrickson, Leonardo LoCascio, Cristina Mariani-May, Tyler Colman, and Sergio Esposito. I was a speaker at the Wines of Portugal International Conference in Oporto in early December 2010. My panel tackled the subject of how Portuguese wines are being covered by international media—follow this link to a discussion of the conference and my talk. “The keynote speeches were by Elin McCoy and Evan Schnittman – both were excellent and thought provoking. 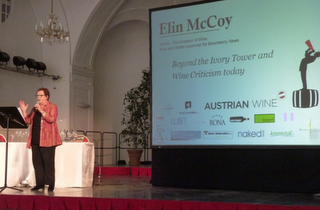 Elin, who writes for Bloomberg News, presented on the future of the wine critic and talked about the change from the old system of wine criticism (the ivory tower critic) to the new more democratic wine criticism that the internet, especially blogging, has allowed to flourish. She stressed the difference between the small number of ‘ivory tower’ critics and now the large number of bloggers on the net. Elin posited Robert Parker as the now archetypal ivory tower wine critic – tasting many thousands of wines a year giving them scores out of 100, probably assessing many wines from countries he has never visited but wielding, particularly in the case of Parker, remarkable and enduring power. For his full report, click here. For a link to the video of my entire speech, click here. Gabriel Savage of UK’s The Drinks Business did a wrap-up of the conference and my speech. She asks “…is the blogger army about to stage a coup for the throne of traditional wine writing? Or has this revolution already swept through the gates, unnoticed by the old guard in their ivory towers? You can read her entire analysis here. At the Fine Wine 2010 conference in Ribera del Duero at the end of April, I joined a panel on the market for fine wine in the U. S. and talked about the changing role of the wine critic. Graham Holter wrote about it for WineBusiness.com. Click here for the complete report. I was recently interviewed by Laura Lawson on the WINE CRUSH radio program. To listen, click here.